BOTH MERSAL AND VIVEGAM, WILL BE THE BIGGEST EVER! The second half of this year 2017, has really big releases lined up that include Vijay’s Mersal in October and Ajith’s Vivegam in August. Both of them are the biggest stars of the Tamil film industry and there is always a huge excitement when both their films release. A point to be noted is that, this time, there is only a two month gap between Vivegam and Mersal’s release plan and this itself is a treat for fans of Vijay and Ajith. Also, both Mersal and Vivegam have had scenes extensively shot abroad and this peps it up even more. The bombastic starcast of both the biggies include the likes of Vivek Oberoi, SJ Suryah, Samantha, Kajal Agarwal, Vadivelu, Nithya Menen and others. However, the most surprising and exciting fact that makes Mersal and Vivegam movies to look forward to are, the budget of these films. Interestingly, for both Vijay and Ajith, Mersal and Vivegam are their respective highest budget films till date. 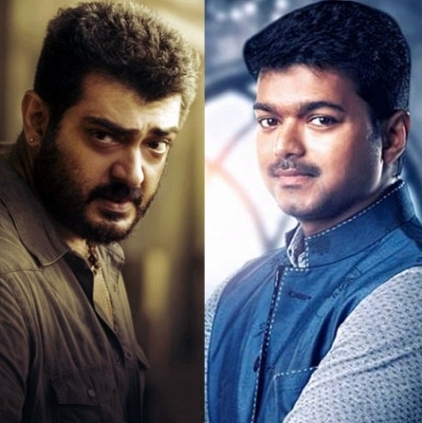 It is something which rockets our expectations from the two most loved stars of Kollywood. Stay tuned for the two big releases in the second half of 2017. Will ticket prices be revised to 90 and 200? Who is the latest to be questioned in the actress abduction case? Confirmed: This is Vijay’s name in Mersal. And it is majestic! Super update on Vishal and Karthi's film! People looking for online information on Ajith, Mersal, Vijay, Vivegam will find this news story useful.